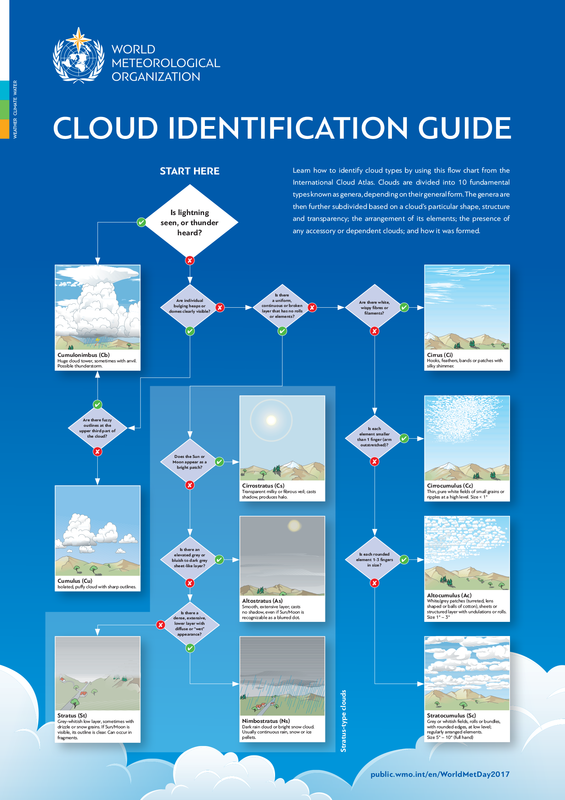 Learn how to identify cloud types by using the flow chart from the International Cloud Atlas. Clouds are divided into 10 basic types (genera), depending on their general form as you can see bellow. Don't forget to check out the classification aid for high-level, middle-level and low-level clouds. Cumulonimbus (Cb) - Huge cloud tower, sometimes with anvil. Possible thunderstorm. Cirrus (Ci) - Hooks, feathers, bands or patches with silky shimmer. Cirrostratus (Cs) - Transparent milky or brous veil; casts shadow, produces halo. Altostratus (As) - Smooth, extensive layer; casts no shadow, even if Sun/Moon is recognizable as a blurred dot. Nimbostratus (Ns) - Dark rain cloud or bright snow cloud. Usually continuous rain, snow or ice pellets. Cumulus (Cu) - Isolated, pu y cloud with sharp outlines. Stratus (St) - Grey-whitish low layer, sometimes with drizzle or snow grains. If Sun/Moon is visible, its outline is clear. Can occur in fragments. The genera are then further subdivided based on a cloud’s particular shape, structure and transparency; the arrangement of its elements; the presence of any accessory or dependent clouds; and how it was formed.